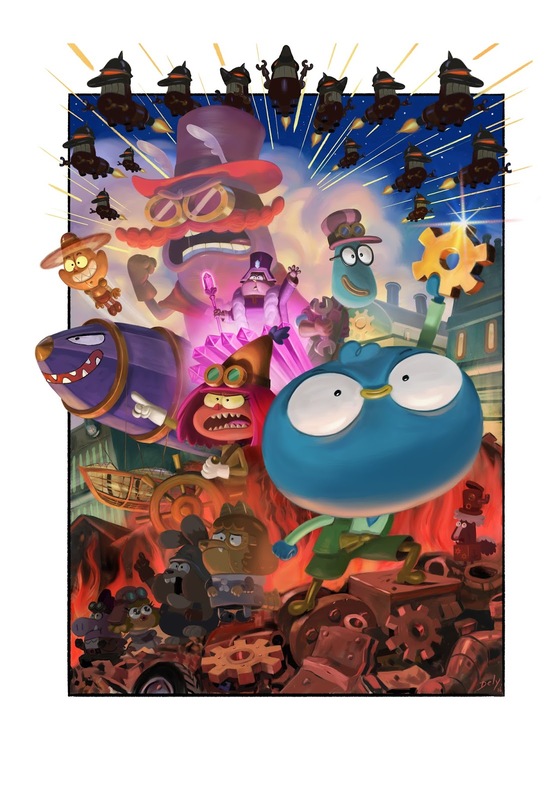 Nickelodeon's HARVEY BEAKS animated television show is featuring a steampunk themed two-part musical special that will debut on Thursday, June 23 and Friday, June 24, 2016 at 5:30pm (ET/PT) on the cable channel. Harvey and his friends set out on a brand-new, imaginary and musical journey where they explore the cogs, gears, and fantasy of the world Steamburg. In Part 1 which premieres on the evening of June 23rd, Harvey imagines he is in a steampunk world, and is blamed for breaking a floating city. Part 2 follows the next evening of Friday, June 24 where the songs and mystery continue when Harvey continues his quest to fix the floating city, but danger looms around every steamy corner. This special two-episode story arc will feature four original songs: "Steamburg," "(Here In Our Town Called) Reject Town," "I Can Tell We're Gonna Be Friends" and "Friendship Can Do Anything." Created and executive produced by C.H. Greenblatt (Chowder), Harvey Beaks follows the life of a big-hearted and big-headed kid and his impetuous two best friends. Together with an odd assortment of townsfolk in their magical forest, they get into all sorts of adventures and trouble. But no matter how ridiculous things get, they always find a way to stay true to themselves. Visit the Harvey Beaks page on Nick.com or the Nick App to learn more about the show and its characters, and get a behind-the-scenes look at the series. Episodes of Harvey Beaks are available on Nick.com and the Nick App, along with digital download and streaming platforms that include iTunes, Amazon, Xbox, Google Play, Vudu, Playstation, and Nick On Demand.